The Korean Catholic Church has 226 years of history. The first Christian from Korea was Lee Seung-hun, who was baptized into the Christian faith in Beijing in 1784. Of the 200-year history of the Korean Catholic Church, half of it has been a series of ordeals and persecutions. During the first 100 years after the Catholic faith was introduced to Korea, the church and many Christians went through numerous ordeals and many Christians were martyred during this period. Therefore there are many sacred places related to these ordeals and martyrdom in Seoul. Now that it’s spring, when everything comes alive, let’s go on a pilgrimage guided by Fr. Ramiro, a Catholic priest from Mexico. During the morning, when the sun casts a long shadow, Myeong-dong is rather calm and quiet. Myeong-dong is the top business district in Korea, but fashion and beauty shops dominate the area rather than offices. Myeong-dong Catholic Cathedral was the first Catholic Church in Korea and a symbol of the church here. It is the place where the first Catholic community was formed in 1784. The current structure was completed on May 29, 1898, 12 years after construction began. It is a Gothic-styled building and designated as the Historic Site No. 258. “After the Myeong-dong Cathedral was built, many martyrs’ bodies were buried in the catacomb of the cathedral. They were those who sacrificed their lives to prove their faith when the early Korean Catholic Church was persecuted,” said Ramiro. The entrance to the catacombs is located at the back of the main building. We just needed to go down just four or five steps. The catacomb had a solemn atmosphere since it is a place was for praying. In 1900, bodies of several martyrs including Bishop Berneux Bishop Daveluy were moved to the catacomb from other places. Later, other bodies of martyrs from different areas were moved here as well. After leaving the catacomb, we slowly walked around the Cathedral, then departed for Yakhyeon Catholic Church. It was only two stops away by subway from Myeong-dong Cathedral. 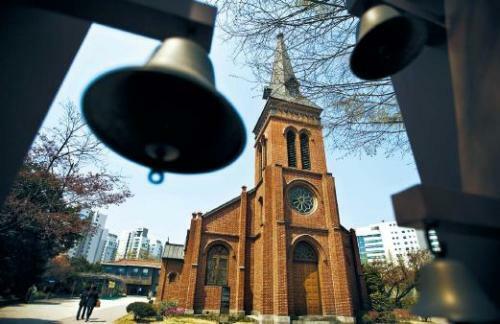 Yakhyeon Catholic Church is Korea’s first Western-style church built in September 1892. 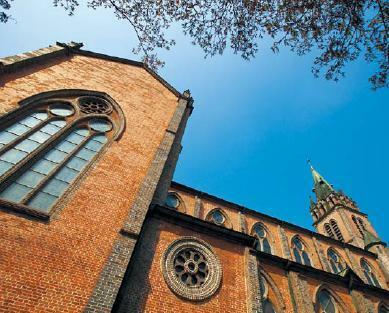 Even though the building was not built in pure Gothic style, it became a model for churches in Korea. The church was also designated as Historic Site No. 252. The first Korean Catholic, Lee Seung-hun had his house near Yakhyeon Church. Yakhyeon is the former name of Jungrim-dong, where the church is located. The meaning of “Yakhyeon” is “hill with medicinal herb fields.” There used to be many herb fields around. Now, however, the fields are all gone. Around the church is so tranquil, you’d never know you were downtown. Indeed, it is a very good place for ignoring the busy world outside and taking a calm and quiet walk. At the back of the church, there is a small memorial related to Seosomun Catholic Martyrs’ Shrine. The memorial is the place where we not only learn about the ordeals of the early Korean Catholic Church, but also the history of the Yakhyeon Church. From Yakhyeon Church, it was only a 10-minute walk to Seosomun Catholic Martyrs’ Shrine. We went down the hill and crossed the main street to see an office and residential building named Brown Stone. At the back of the building was Seosomun Neighborhood Park. This park is the martyrs’ shrine. Of course, there remains only a memorial tower within the park. There are 103 saints in Korea, all of whom are martyrs. Forty-four of them died as martyrs here. This area used to be a crossroad outside of Seosomun. There were countless believers who suffered martyrdom here. This place was dyed red with martyrs’ blood, but now it is a calm and quite park. Thanks to those who died to prove their faith, the Catholic Church was able to spread strong roots in today’s Korean society. The menu for lunch was “kimchijjigae.” Ramiro loves spicy food. Fortunately for us, we were told that this was one of the four best kimchijjigae diners near Seosomun Catholic Martyrs’ Shrine. The name of the diner is Jangho Wanggopchang (02-756-5079). It is just across the street from the shrine. The diner is casual and small, but it is very hard to find a table during lunch time. The secret of its kimchijjigae is the kimchi, which is fermented for a long time. We took the subway to Saenamteo Shrine. 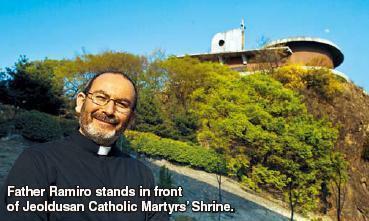 Saenamteo is also one of the representative Catholic martyrs’ shrines in Korea. Among the 14 priests who were martyred in Korea, 11 died here at Saenamteo, including the first Korean priest, St. Andrew Kim Tae-gon, as well as the first foreign missionary and Chinese Catholic priest, Zhou Munmo. Saenamteo is a short for Saenamuteo which means “grass and trees.” As the name indicates, the area used to be a large and thick forest. In the early Joseon Dynasty, it was used as a military training site and an execution ground for felons. Saenamteo Catholic Church is a 3-story, tile-roofed building with a Korean-style belfry. The inside of the church is also decorated in a traditional Korean style. Behind the cross, is the “Taeguk” symbol. The altar is shaped like a Korean royal table. Other furnishings were also shaped after traditional Korean items, such as the holy water fonts in the form of Korean pottery, a podium shaped after janggu, which is a traditional Korean musical instrument. St. Mary and Jesus in the holy paintings on the wall are dressed in traditional Korean royal dress. A guided tour around the church is available upon request. 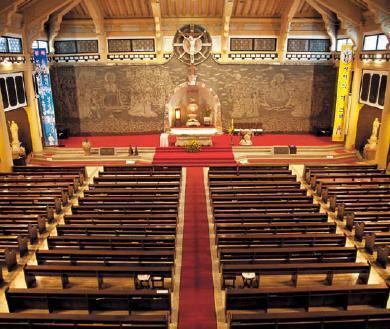 In the Catholic Martyrs´ Memorial of Saenamteo, nine martyrs, including St. Andrew Kim Tae-gon were laid to rest here. “They did not understand what religion was. This tragedy was caused by the anxiety of the privileged class,” said Fr. Ramiro. Jeoldusan Catholic Martyrs’ Shrine is connected to the riverside of the Han, which is the best place for a relaxing walk. Another highlight is watching the sunset there. Isn’t it meaningful to finish the day reflecting along the Han River? Father Ramiro is a priest from the Guadalupe Missioners. He was dispatched to Korea in 1994 and returned to Mexico for his studies at graduate school. After four years, he came back to Korea. The first foreigner he met when he was a sixth grader was a Korean and the priest professor at the seminary had studied in Korea. Thus, he was interested in Korea from a very young age and chose Korea as his first post after graduating from the seminary. Near Jeoldusan Catholic Martyrs’ Shrine, there is an alley where small but chic cafes are located. It is the first alley on the left from the No. 7 exit of Hapjeong Station. The next alley is toward the Shrine. Le four (02-326-6218) is well-known for handmade cakes and M.O.I (02-332-8973) serves authentic pasta dishes at reasonable prices. Strawberry on the shortcake by Hong Sung Sa (02-335-1559), a café with quite a long name, is a book café serving tasty drip coffee. In addition, Jeongmiso (02-337-3276) is a Korean restaurant specializing in bibimbap. This restaurant is also popular among foreigners because of the fresh ingredients and neat table settings. 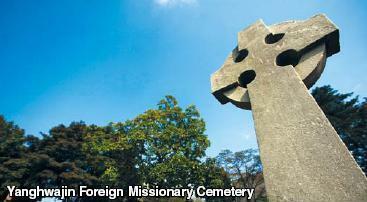 This place is not a Catholic-related site, but a cemetery for foreign Christian missionaries. This place also has a tranquil atmosphere. Since it is located next to Jeoldusan Catholic Martyrs’ Shrine, it is worth paying a visit. However, even though it is an outdoor space, the cemetery is opened to the public only during operating hours. If you visit Yanghwajin Hall after looking around the cemetery, it would be a good opportunity to better understand the history of missionary work in Korea. Yanghwajin Hall is located next to the cemetery. Opening Hours: Monday through Saturday 10:00 a.m.-5:00 p.m., and closed on Sundays.